Thursday afternoon found me tooling along the highway headed for home. I settled in for the four hour drive. I had to be extra alert during the first forty-five minutes due to the rain. It would be light and misty requiring the intermittent wipers to a downpour then back to misting. Of course there was traffic causing all kinds of wet spraying every part of the car. Ahead I could see a break in the clouds. Was that blue sky peeking out from puffy white balls of floating cotton? Yes! I drove out of the rain and all the bugs from my windshield were magically wiped away. Traffic has lightened up considerably. There are a few cars in my rear view mirror and a big truck hauling something ahead of me. I begin to relax and take note of the landscape around me. Three days ago the trees were bare, today there is a greenish haze beginning to form. The redbud trees’ fuchsia blossoms stand out against the browns of the trees surrounding it. The fields have turned emerald . . . pow! thunk! crack! An explosion of sound interrupts my thoughts. What was that? Then I see it. 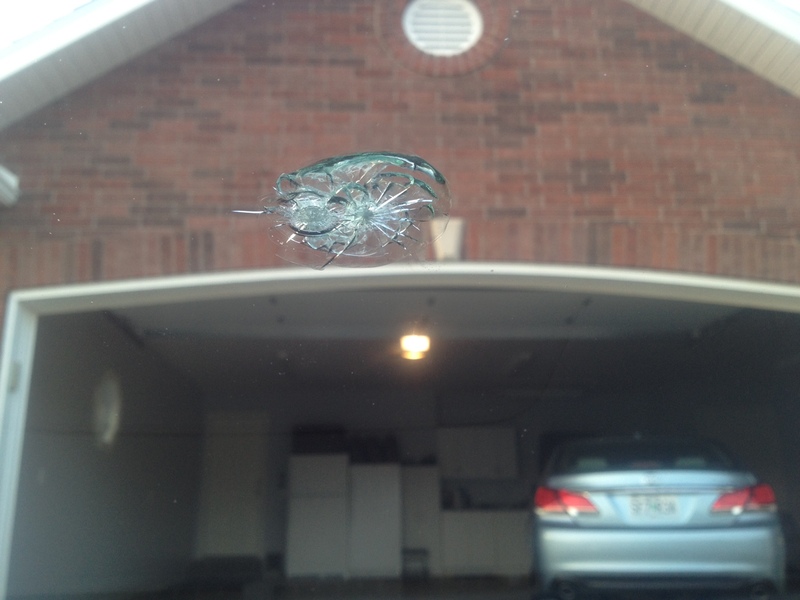 Something has hit my windshield and oh my! This is not a little chip. I know a new windshield is in my future. This is the view of the damage from inside the car. Fortunately it was not in my line of vision all the way home. I look around (as well as you can at 68 mph) to see where, what happened. My eyes rest on the truck ahead of me. Did he throw a rock up with his tires? Did something come loose from the big metal box-like thing he was carrying? What should I do? Who’s going to pay for a new windshield? All of these questions race through my mind as I keep this truck in view. I called my husband to report the news. “Should I get this truck’s license?” I ask. “If you can I suppose that would be good. But how would we ever prove that he did it?” he replies. “I will call insurance and see what we need to do.” He hangs up. Cautiously, I get closer to the truck. I cannot see a license anywhere. This truck is speeding up, soon he is going way faster than I want to to. So I watch, as he drives away, leaving my damaged car behind. 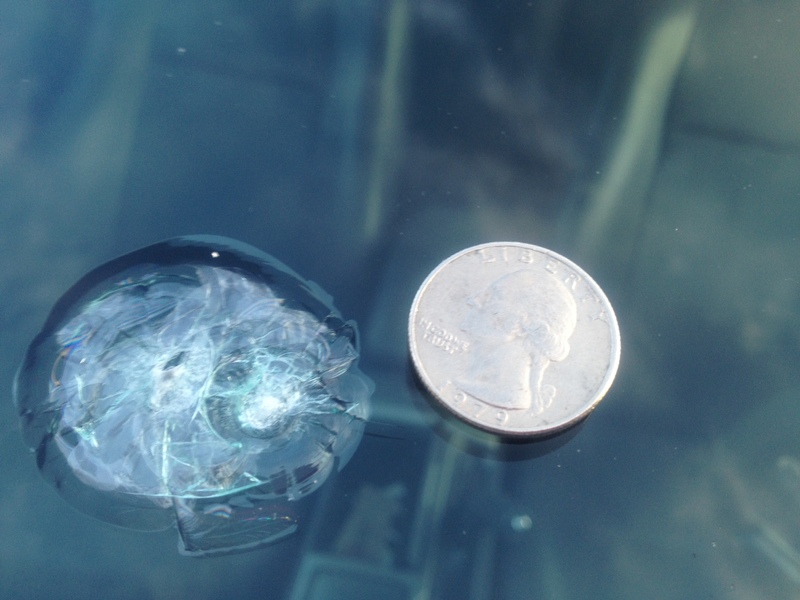 I am grateful that it didn’t hit my roof and tear it (it’s a convertible). I reach out to touch the inside of the windshield. I expect to feel a fracture, but it is smooth as can be. Just in case you were wondering, the fields had turned emerald green. I think they were not yet finished celebrating St. Patrick’s Day. Here you get an outside view and something to compare it to in size. Woah, that is a big dent on your windshield wiper. I’m glad to hear that you got home safely in the rain. That’s always so scary when something happens like that! I like the way you are driving along admiring the spring scenery when you are suddenly hit. Here the story changes. What an unfortunate event. Then I like the way you go back to telling us about the field. It’s really the way life is when unfortunate events happen. We have to stop for a minute, but then we just go on. What else can you do? Sorry about your windshield. I am amazed you were able to compose yourself so quickly after a startle like that! Sorry that your noticing was accompanied by a whacking sound. Woah…that was one big “ding”! I’m glad that you made it home safely, Elsie! I do like how you came back to comment on the fields of green, before you were rudely interrupted. Glad you got home safe too! Oh no! I love the way you took us right into the middle of your thoughts about the beautiful scenery passing and then “pow!” — right in the middle of your sentence! You captured this moment so perfectly, and then your ensuing worry was described in such detail as you brought us back into your thoughts. I felt like I was right there in the car with you, especially with the pictures to show what a big chip it is! Hope your windshield gets fixed soon! I thought I was in just for some beautiful spring landscape and then “pow, thunk, crack.” You had me there. You even thought of the driver losing something down the road. Great storytelling. Glad you were okay. Today I have a long drive home and will happily forgo the pow! thunk! crack! Elsie I loved how you ended with the green fields not finished celebrating St. Patrick’s day. Unpleasantness happens but we can move on to beauty. I also enjoyed the way you interrupted your story with the sound of the damage. It must have been like the interruption of your thoughts as you were driving. I’m sorry for your windshield but glad to hear you were safe. You are a natural storyteller, Elsie. Like Ruth, I found the way in which you set the reader up for the PING! very effective. I also like the way you take the reader into your thoughts as they come, in real time. Something similar happened to me with the skylight on my car. It was probably a rock from a truck. It’s a real shocker when you hear that smack! Thank you for your comment today. That was an unsettling one to write. I was trying to balance being too open/personal given this format but also wanted to write as it has been nagging at me all week in different ways. I’m sorry to hear about your connection but grateful that you shared it. It helps to know people connect to those things in our life which are difficult. The last comparison really brings out the size of the damage. I’m thankful you were safe. Your piece transitioned from the enjoyment of the scenery to an interrupted suprise. Nicely done. I had to laugh at how things were so peaceful in your description of the fields, etc. and then the WHAM! Great writing there. You made a beautiful piece out of an unfortunate event. Sorry to hear about your windshield. That thing is huge. Great storytelling here! So sorry about the damage to your car though. My experience with car insurance is that it is just easier to pay for things like this on your own since it only makes rates go up. So glad you weren’t hurt and arrived safely home. I noticed how you started in past tense and then switched to present tense. I’ve been trying to help my students do this, so I’ll share this with them. I can’t help but experience a little garage envy, it’s neat as a pin! Funny that you should notice my tense switching. I played with that, had the two tenses, then switched to the past and present. I liked the way it sounded better with the change. So that’s what I went with in the final copy. I like how you use setting description to set the mood, making the reader feel at peace and then — WAM — we’re hit just like your windshield. As always, I love to see words + photos come together in a slice.